Following its announcement late last year, we are treated to a closer look of the Nike Air Max 1 Essential “Olympic.” Released shortly after the unveiling of Japan’s Olympic logo for the 2020 games, this clean and patriotic iteration has been constructed from a white, tumbled leather upper with rich blue mesh paneling leading from the toe box towards the shoe’s lace column and down throughout the insole. Complimenting the subdued palette are hints of red seen across the design’s embroidered heel branding and Nike Air sole unit with a contrasting, metallic gold Swoosh detail extending in the same color to the tonal lace aglets. 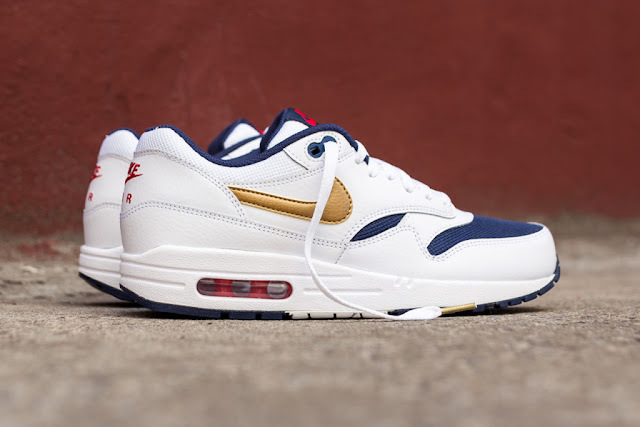 The Nike Air Max 1 Essential “Olympic” is now available to buy from KITH for $110 USD – head over to the store’s official website for more information.